Tell us how and where you originated. 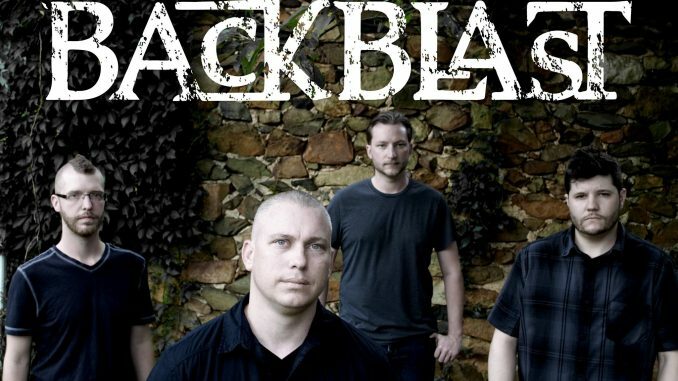 BackBlast originated in early 2015 with myself (Dan Cunningham on vocals), Marcos Eguia on guitar and Chris Tamberella on drums. I met Marcos through an online ad looking for fellow musicians to play with and Chris is actually my cousin. What started as a group of guys just jamming for fun quickly turned into something more. We added Joe Daugherty (Bass) about 6 months after the inception of the band, and Adam Pritcher’s (Guitar) talents came into the band when Marcos found out that he had to move out of the area early in 2016. And where are you now in your career? 2016 has been an absolute whirlwind for us. Since we started playing dates locally and throughout the east coast, the reception to our music has been incredible. We hit #1 in the Regional Unsigned Metal Charts, and were approached by multiple promoters to work with some incredible bands (Nervosa, Suspended, Mobile Deathcamp, Kataklysm, etc). We have partnered with Dave Maguire who is the owner/operator of Crashbox Studios (www.crashbox.biz) to produce and engineer our upcoming EP which is due out in early 2017. In addition, we are going to be announcing a mini-tour for December that will be hitting Chicago, Minneapolis and Cleveland. Any shows coming up? If so where can your fans look for you? We have some incredible shows coming up. Dan what was the first concert you attended? If we’re going to get technical, my first concert was New Kids on the Bock at Giants Stadium when I was a really small little guy. I would say my first real concert I saw was in NYC in 2000 when I saw Lamb of God. Growing up I wasn’t really that big into metal to be honest with you. I was more into punk, hard rock and grunge type bands. When I saw Lamb of God I was hooked. It was the most insane atmosphere and I knew I wanted more. What made you start playing your style of music like what bands influenced you the most? Our music is what I like to call “Melodic Tough Guy Metal”, and our sound truthfully just came organic. We didn’t start playing together with any real style in mind. I think that is why we love writing and performing so much. I have never played in a band where musical styles have clicked so well. Our band has so many different influences its pretty nuts. Myself, I am a huge fan of Dio, Sevendust, and Lamb of God. However, I am also a massive fan of bands from other genres like MXPX, Bad Religion, 311, The Beatles and so much more. Chris, Joe and Adam also have a large range of influences that really shape how we write our music. Does anyone in your family .have any music skills that you picked up on? Absolutely! My grandfather, father, brother and cousin all are incredible drummers. However, I never learned how to play and was more interested in singing growing up because it came naturally to me. My father was obsessed with music. When we were in the car, we would listen to The Beatles in alphabetical order. I would sing along to every song and also practice harmonies to it. In your opinion what is your best song to date? Wow, now that is a tough one for us. I am going to have to answer that in two different ways. 1st. Speaking for myself, I would say that our best song to date would be Crying Shame. It tickles all the senses. Melodic and heavy vocals, excellent timing changes and a story of a soldier who just has had enough. However, the best song that is available to the public to stream or download is Ring Master. It’s a song about a man who has taken every outcast from all corners of the world to rise up and take down the bully’s that have held them down for their whole lives. Well thank you. We were sitting down and just spitting out names, when I spit out BackBlast. Being an army veteran, I learned that a back blast is hot gases and danger area behind a rocket launcher. Everyone loved it, and that’s all she wrote.